What Temperatures Will Kill Tomato Plants? Tomatoes (Solanum lycopersicum) are tropical perennials grown as annuals in temperate climates. Temperatures below 32 degrees Fahrenheit will readily kill tomato seedlings. Daytime temperatures below 55 degrees will stunt growing tomatoes and decease tomato yield. If daytime temperatures drop below 50 degrees, tomato plants will survive but not yield tomatoes. Home gardeners typically plant nursery seedlings. You can grow your own seedlings indoors by planting seeds six to 10 weeks before the last expected spring frost in your area. Tomato seeds germinate at 60 to 95 degrees, although they germinate best at 75 to 90 degrees. At 75 degrees, seedlings will emerge from the soil in six to 12 days. When the seedlings emerge, they should be kept at 75 to 85 degrees during the day and 65 degrees at night. 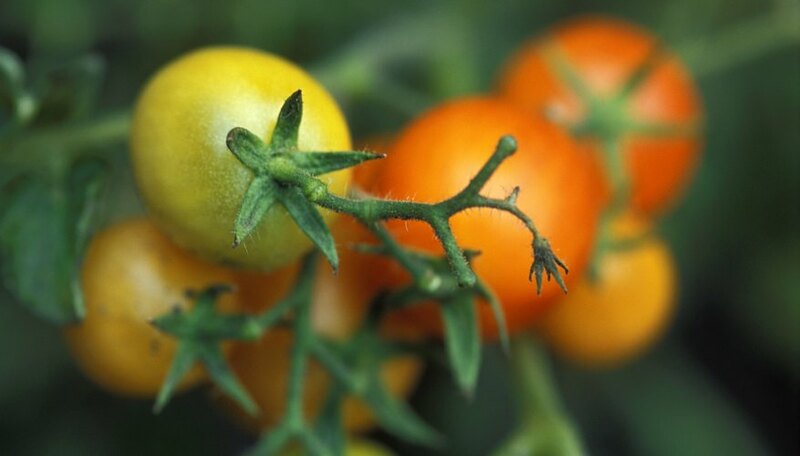 If transplanted nursery seedlings or seedlings that you grow yourself are exposed to daytime temperatures of 60 to 65 degrees and nighttime temperatures of 50 to 60 degrees, they are subject to catfacing, a term for flat-shaped tomatoes with corky brown scars at their bases and cavities in their flesh. Use row covers or black plastic to keep seedlings warm early in their growing season. Remove the protection when temperatures rise above 85 degrees. Tomato plants will drop their flowers, decreasing yield, when night temperatures drop below 55 degrees or remain above 75 degrees or when day temperatures exceed 95 degrees. Tomatoes needs late-spring and early-summer warmth to mature and ripen. Tomato flavor and color are best with average daily temperatures of roughly 75 degrees. When tomatoes are ripening, temperatures above 92 degrees will reduce their color, texture and flavor. High temperatures will turn their skin yellow and their interior white. You can pick ripe mature tomatoes and store them for one to six weeks at 55 to 60 degrees in a paper or plastic bag. They will ripen in four to 10 days at 68 to 72 degrees. Many cultivars that bear large tomatoes take 80 to 100 days to mature and ripen. If you live in an area with short, cool summers, seek out cultivars that ripen in 68 to 75 days. When you select cultivars, be aware that seed companies and plant nurseries often underestimate the maturation time of tomato seeds and seedlings they sell by 10 to 15 days. How Many Tomatoes Will the Average Plant Produce?